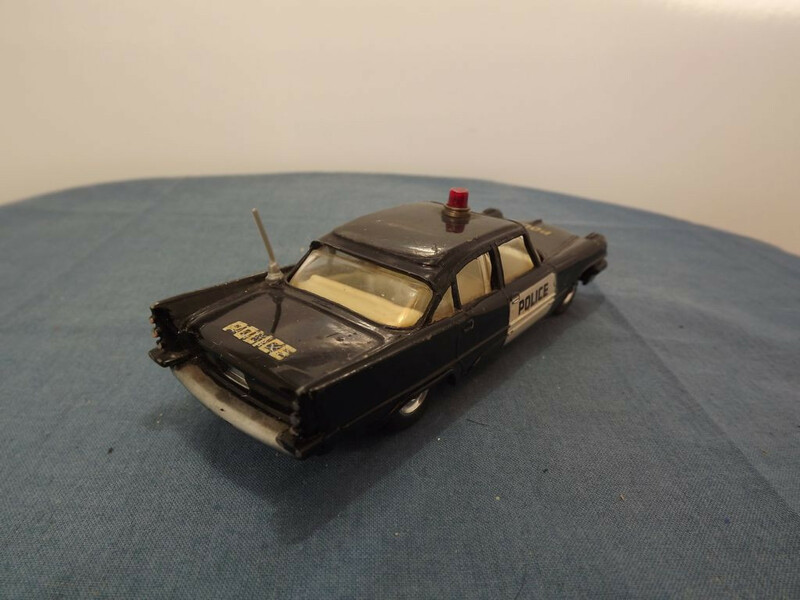 This model is the Dinky 258-G-1 De Soto Fireflite Police Car in black Police livery. 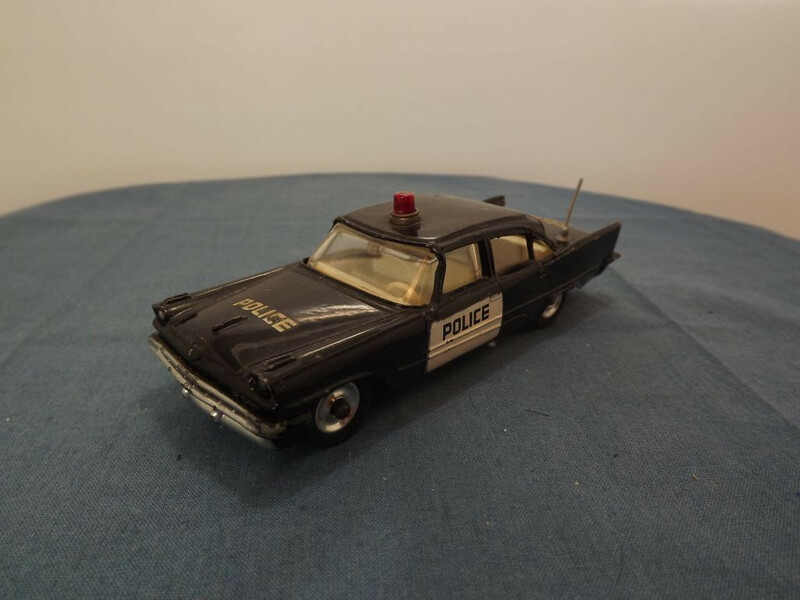 This release was generally coded as the "USA Police Car" and was release using 4 different castings: the 147 Cadillac (1967-68), 148 Ford Fairlane (1962-67), 191 Dodge Royal (1961-62), and 192 De Soto Fireflite (1960-61). At the front the grille, side lights, bumper and number plate are cast into the body casting. Only the grille, headlights and front bumper are mask sprayed silver. 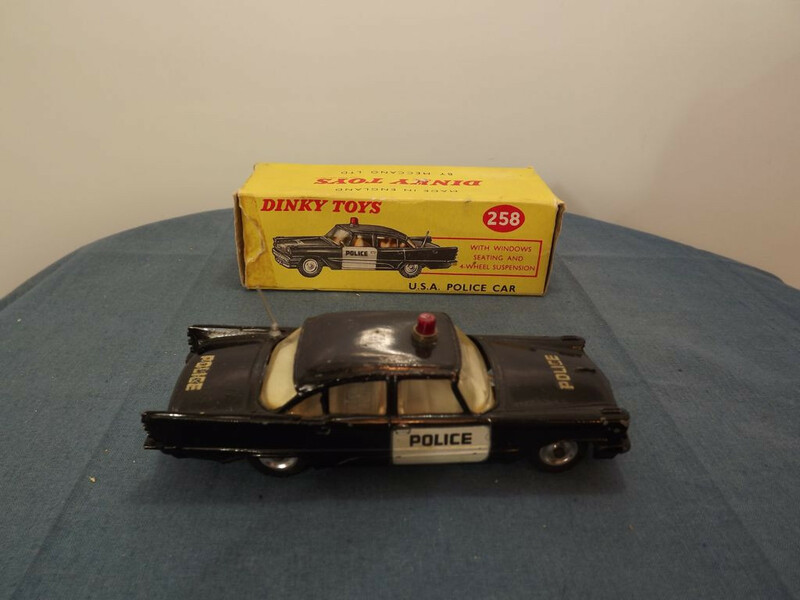 The front bonnet and rear boot lids have a decal reading "Police". The roof sports a red plastic roof light. The side front doors carry a white panel with the word "POLICE" in black. 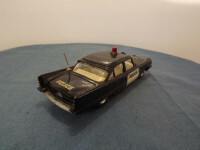 At the rear the numberplate and rear bumper are mask sprayed silver and the cast rear lights show evidence of either pale red or orange painted lenses. A grey plastic aerial is inserted into the rear left hand side wing. The interior consists of a creamy white plastic dashboard, seats, rear parcel shelf, and floor. A white plastic steering wheel is inserted into the dashboard. The glazing is clear all round. All wheels consist of spun metal hubs with black rubber tyres. The baseplate is black painted metal. 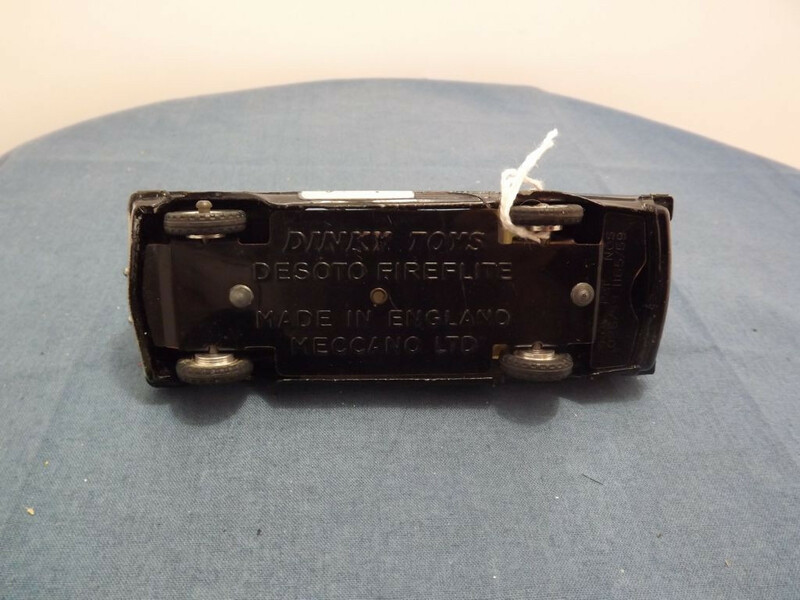 At the top centre it has "Dinky Toys, Desoto Fireflite" on two lines, "Made in England, Meccano Ltd" at the centre bottom on two lines, and "Prov. Pat. Nos., 1026/59 1165/59" on two lines at the rear, parallel to the rear axle. It is held in place by two machined rivets at the front and rear. This item was issued between 1960 and 1961 only and comes with its original Yellow picture box.